Have you ever looked at your perfectly dressed child and then glanced at yourself and wondered, “Whoa, what about me? !” I refuse to go down that road. For me, the secret to keeping it all together is finding quick and easy solutions that really work. If they involve too much time, they’re not for me (simply because time is a luxury I do not have much of these days). 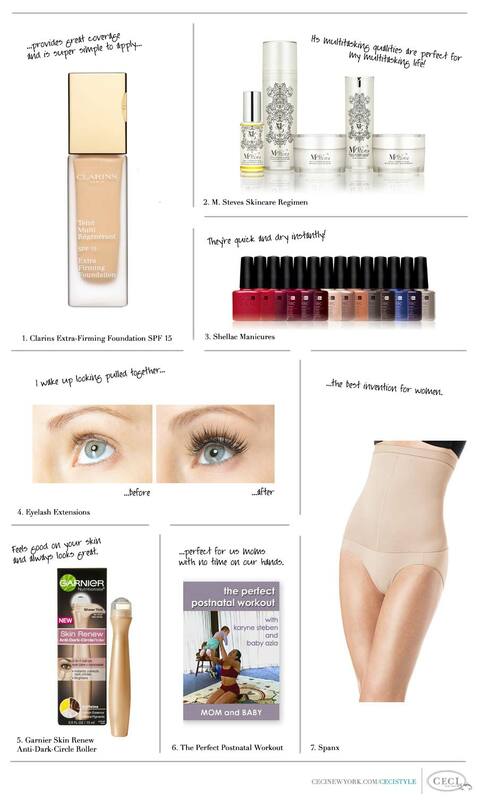 So I thought I would share these great products that have helped me seem pulled together despite all I am juggling. Try one or all, and trust me, you will be feeling a lot better about yourself! These products are amazing for all busy ladies on the go, not just moms! I highly recommend trying. M. Steves Skincare Regimen Have you ever been so happy with a product that you want the whole world to know about it? That's how I feel about the new skincare line M.Steves, which I introduced to you a few issues back. Its multitasking qualities are perfect for my multitasking life! I honestly love it. It's easy to use and, best of all, so effective. I can really see results in the way my skin looks and feels. If you can, I recommend trying the whole line together to achieve maximum results. There are only 5 products in the line, so it's not too overwhelming to choose from. Where to get it: www.msteves.com Type the code CECISTYLE to enjoy 25% off on the M. Steves website when checking out. Here's to a beautiful new you! Shellac Manicures I am a big believer in having nice nails (especially for work). However, getting a manicure every weekend like I used to (pre-baby) is just too hard. But ever since I tried the Shellac manicures, I haven’t gone back to the regular ones. They're quick and dry instantly (no more wasting time at the dryer). Plus, they last for 4 weeks and never chip or lose their shine! I love that I only have to go once a month instead of once a week! Brilliant. Where to get it: I'm pretty sure most nail salons offer Shellac (or gel) manicures. Just ask next time you go to your local salon. They are more expensive than your standard manicure, but less expensive than getting a manicure every weekend. Eyelash Extensions At first I was afraid to try these as I didn't want to look fake. But my good friend and beauty expert Heidi Evora-Santiago from Damali NYC convinced me to give them a try. I am so happy I did because now I'm hooked! They look and feel amazing and brighten up my tired eyes. But the best part is that I wake up looking pulled together. No more runny mascara eyes. Because the lashes are black you look like you have mascara on all the time! Where to get it: Most beauty salons now offer this service. It's important to make sure they do a good job. Ladies in NYC, search no further. Call up Heidi Evora-Santiago at Damali NYC and mention you saw this on CeciStyle and she will honor a generous CeciStyle Insider deal of 20% off her services! You will love your new eyes!